Bhai dooj is a festival of mutual love and affection between brother & sister. It is also known as Yamaa dvitiya. There is one tale related to it :- Once, on the day of kartik shukla dvitiya, Yamraja reached his sister Yamuna’s(the holy river) house. Yamuna did a hearty & warm welcome of her brother. She prepared various delicious dishes for her brother and applied a tilak on his forehead. Yamraja was overwhelmed by his sisters welcome and he gifted many things to his sister. When He was leaving, He requested Yamuna to ask for a wish. Yamuna on seeing him requesting ,said: ‘Brother ! If you really want me to ask for a wish, then bless me with the wish that every year on this day you will come to my house and will accept my welcome. Similarly, every brother who will to his sister’s house on this day and accepts her welcome and gives her gifts and all, he never has to face the fear from you. Yama accepted Yamuna’s request and from that day on, this festival of Bhai dooj is being celebrated. The main objective behind this festival is, that strong bond of love & affection between brother & sister remains forever. The sister on this day, while applying tilak to her brother must think with strong determination that ‘May my brother’s wisdom arise’. Pray to God Yamraja for your brother’s longer life and pray to your Guru & God for your brother’s welfare and progress. Then remember eight immortals- Markandey, Bali, Vyasa, Hanumana, Vibhishina, krupacharya, Ashwathama, Parshurama, and sprinkle rice over your brother and with soulful feeling ”May my brother become strong and immortal.” The brother should too sprinkle some rice and pray ‘ May my sister have a strong character, She should be fully secured from all evils, she should spend her life with fearlessness and not under some pressures or fears’. – Wake up before sunrises, One who keps sleeping after sunrise is responsible for the destruction of his own wealth. – Everyday offer salutatiom to Sun God. This helps in developing one’s health, mind and radiance. – Offer food to mother cow. This helps in eliminating domestic evils. So everyday keep aside first byte of food for Cow. – Offer grains to birds everyday for prosperity in your house. – Do as much service as one can to the poor along with God’s Naam Japa and listening to the mythological stories. – Worship the Peeple and Basil tree and light a diya near them. – Keep aside 1/10th part of your income for charitable deeds. This gives you happiness while in this world and after the world and makes one wealthy too. – While cooking roti (wheat bread), don’t throw the flour spilled near by. Mix some sugar into it and offer it to the ants. This way, you will make best use of it and would prove to be meritorious. – The human body has been designed to intake vegetarian food only. When we kill & eat innocent animals ,we eat the fear, pain, sorrow within them which entered into them at the time of killing them, so one must eat vegetarian food only. – Tea, Coffee is harmful for the health. Instead of that, have cow’s milk . – All the drugs like Gutka, Tabacco, Liquor etc. are the causes of life taking diseases like cancer. Therefore, stay away from the addictions and motivate others too for this. Lighten up yourself internally alongwith external light! Its important to clean your internal self besides cleaning up your house. As long as there is the darkness in the disguise of evils and lack of knowledge, the man is considered to be blind inspite of having eyes. The way you decorate your house with new and attractive things on the day of diwali, buy new clothes and colour your house, same way throw out your weakness, evil thoughts and vices and get virtues like happiness, peace, satisfaction, forgiveness and decorate your inner self. At some places sweets are being taken during the whole year, not only this, but the eatables etc. get rotten without even using them and at the same time there are places where the children crave for one piece of sweet on diwali day. There can be seen plates full of different dishes in some houses and there are places too where children sleep empty stomach. Somewhere new clothes are being bought and some don’t even have enough clothes to cover their bodies. So start your Diwali by lightning a diya at some house where there is not a single diya is being lit. Your heart will glitter too and the happiness you will get will definitely be more than celebrating diwali at your own house. You must follow the tips given to gain wealth but be careful that Goddess laxmi in disguise of wealth will arrive & leave as per your destiny but Goddess laxmi which belongs to Lord Vishnu is the giver of Divine virtues. If one achieves that, then material wealth will hardly matter if it stays or leaves. If you actually want a happy, healthy and contented life, then follow spiritualism. 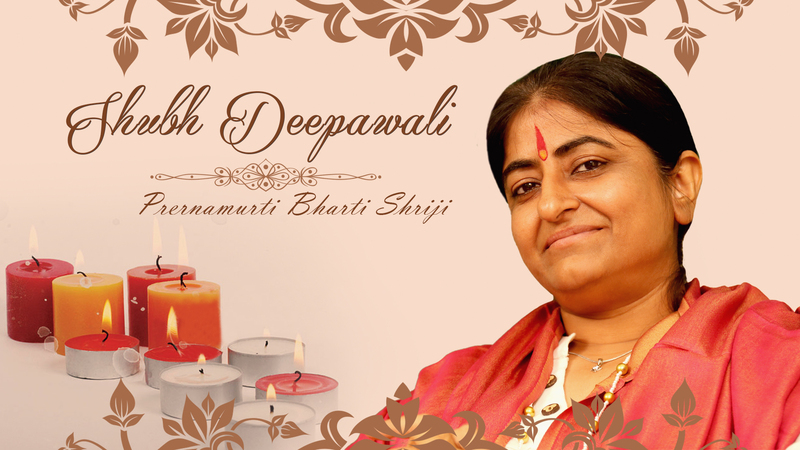 Diwali conveys message that wealth is unstable, people die for wealth but the wealth doesn’t even ask once while it leaves “Shall I go?” Therefore, considering wealth as unpredictable and unreliable, take God’s name, do Japa , listen to Spiritual discourses and decorate your inner self with peace, satisfaction & live at par. May the new year is filled with new thoughts! Take any resolution on the day of new year. whatever flaws or faults are there within your personality , only you can judge nobody else can know that, be it your parents, friends & relatives. Burn & destroy all your drawbacks or flaws into the Diwali crackers and the flames of diyas and resolve not to repeat those mistakes again in your life time & say – God’s divine power is with me …Om Om Om I’m healthy…Om Om Om.. I will leave all old bad habits and start a new and fresh life. Seek blessings from your parents, Grand Parents, Your Guru(Master) and saints on this day. After bath see your face in a bowl full of Ghee. On the day of new year the darshana(sight) of white flowers, fruits, seven grains, water pot, mother cow, cow urine, rice, Lord Hanuman, Lord Ganesha, Shiva Celibate, Sage, Guru Chaste (Of married woman), Srimad Bhagwad Gita, Peacock Feather, Cow ghee, Cow dust, White salt, Peepal tree, Tulsi, and Amla tree….is considered to be auspicious and meritorious. Out of the above said things, must do darshanas of as many as possible. Hang a Toran(festoon) made up of neem leaves or Ashoka tree leaves on your main door. Ashoka is considered to be auspicious and neem is considered to be healthy . When we move around and this toran leaves touches our head, our health remains good and our immunity power improves. 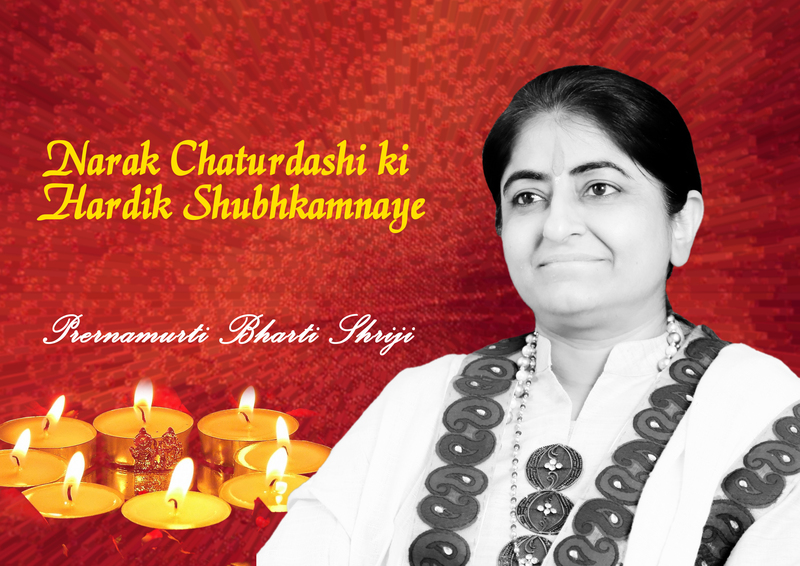 – May the renaissance(Navchetna) of new year takes us to our spiritual elevation. – May the truth, love, humanity keep enhancing. – May we don’t repeat our mistakes of past in the new year. A series of diyas had been lit to welcome Lord Rama for his victory over Demon Ravana. From that day onwards, this festival is being celebrated. According to Puranas, Churning of Sea took place on this day and Goddess Laxmi had appeared. The incarnation day of Goddess Laxmi is celebrated as ‘Deep utsav’. The great epic ‘Mahabharata’ says that the safe return of Pandavas from exile was being celebrated with the series of diyas to welcome them. Diwali has been related to this episode too. It is also believed that king Prithvi did ‘Prithvi Dohar’ and had made the country prosperous, Diwali is being celebrated from that day. Whatever the reason may be, it is clear that the objective behind celebrating Diwali is prosperity, happiness, victory, wealth , health and development. Wake up early in the morning and take bath with seven grains scrub paste(ubtan) i.e. wheat, Jau, rice, gram, moong, udad & sesame. This benefits you with both health & virtues. Put some of this paste and sunflower oil in a bowl of water and give salutation of Sun God. Then worship mother cow and apply a tilak of this paste. In the evening, make a ‘Swastik’ sign with turmeric near the main door of your house, office, shop etc. Worship this Swastik with flowers and rice and place 2 diyas of Ghee and 2 diyas of oil facing four directions. Worshipping Goddess Laxmi on Diwali has special significance. On this day rich or poor, everybody worships Goddess Laxmi for wealth and tries to please Her. Clean your house and yourself first and keep the idol of Ganesha on the right side & Goddess Saraswati on the left side of Goddess laxmi. In the evening light diyas, wear yellow coloured clothes, apply kesar tilak and pour milk on the Goddess Laxmi’s silver coin with the feeling of bathing it. Therafter chant the mantra “Om shreem kleem Mahalakshmaya Namo Namah” for 108 times, offer 108 rose flowers and light 4 faced diya. Make sure that this diya lightens for the whole night. After puja worshipping, chant the mantra “Om Namah Bhagyalaxmi chavidmahey Ashta laxmi cha dhimahi , Tanno Laxmi prachodyat”. On Swatik beed string do atleast 2 rounds of japa. This will eliminate poverty. Follow this procedure from the day of Diwali to Bhai dooj. Where Does Goddess Laxmi Reside? Once there was an old man who happened to be very rich. He was very well off, had all luxuries under the sun, but everybody knows the nature of Laxmiji.. its unstable, mobile and frivolous. One night the old rich man had a dream that one woman is going out of his house. He asked her ‘O Goddess who are you? When did you come to my house and Why are you leaving this house and where are you going now? The old rich man said “I’ve got four daughter in laws, I will discuss with them and tell you. You please come tomorrow. The old man discussed with all of his daughter in Laws one of them told him to ask for food godowns, the other one suggested to ask for the lockers full of gold and silver. But the youngest daughter in law had come from a religious & cultured family. She used to attend the religious discourses since her childhood. She said to her father in Law: “Father if Laxmiji has decided to leave she will definitely leave and what ever we will ask from her, that is materialistic and will definitely leave us one day. If we’ll ask for Gold, silver, money etc. then our coming generations will spoil their lives in ego and lethargy. Therefore, you please tell Goddess laxmi that if SHE wishes to leave, must leave but bless us with the wish to serve saints , sages , devotion for God and that religious discourses always keep happening in our house and the mutual love & affection always remain present amongst our family members. So that the tough days passes through smoothly. Next day, the rich man dreamt of Laxmiji and Laxmiji asked :- “Have you discussed with your daughter in laws? What do you want? Goddess Laxmi got surprised on hearing this and said, “What have you asked for ! The house where saints, sages are being respected and served, where religious discourses keep happening and there remains present mutual love & affection amongst family members, there resides the ‘Lord Narayna’ himself and where ‘Lord Vishnu’ resides, there I serve HIS lotus feet & I cannot leave that place even if, I wish to. You have forced me to stay here. How to Keep Wealth Stable? Everyone worships Goddess Laxmi for its stability but when wealth arrives, many evils like greed, anger, ego, lack of kindness etc takes place in man’s nature. And when these evils become stable within man’s personality, the unstable natured ‘Laxmi’ becomes more unstable. It has been said too that wealth has 16 virtues but 64 vices. But one who does good deeds, serve others, charity and does Naam Japa and uses his money for religious purposes, Lord Naraina remains happy with him and where Lord Vishnu is happy, Laxmiji becomes happy and stable. Lord blessed him with the same, that whosoever will light diyas on these three days, Goddess Laxmi would never leave him. On this day , Goddess Laxmi resides in oil and Goddess Ganga resides in water. Therefore, one who gets up before the sun rises and does oil massage and thereafter have bath, does not have the sight of ‘Yamloka (the hell)’. One who takes bath after sunrise and doesn’t offer diyas for Yamaraja after sunset has to suffer badly. After taking bath wear fresh clothes, apply tilak on your forehead put some sesame seeds in a bowl full of water and stand facing south direction, chant the following mantra thrice and offer the water filled in your palm thrice and light a four cornered diya. This process is called auspicious Yama- Tarpan (offering to Yama). This destroys all the sins happened by you during the whole year. To please Goddess Laxmi chant “Om Shreem Hreem Kleem Kamalvasinye Swaha.” In the night make ‘kajal’(kohl) using mustard oil and pure ghee in a diya and apply it into your eyes. This improves eye sight and saves from evil eyes. The countries & communities which celebrate the maximum festivals are considered to be the most prosperous / developed ones. There is hardly any date or day left in “Indian Panchang”(Hindu Calendar) when there is no fast , festival or celebration. In India, there are celebrated around 80 festivals as important ones and they all are celebrated with a unique style which cannot be seen anywhere in the world or any culture. Dipawali which is being celebrated on the occasion of victory of Lord Rama over the demon Ravana, conveys the message to us as to how to win our internal evils and enlighten our hearts with the lamp of wisdom/ knowledge. Everybody Knows that on the occasion of Diwali, the houses get cleaned, painted and the wastes are being thrown out, the houses are decorated and the diyas are lit. Generally, this festival is a symbol of mutual love , affection , warmth & jubilation, but as per the directions given by our holy scriptures to celebrate Diwali, the style, culture and the objective behind it is unique and full of scientific reasons , which is helpful in our physical, mental & spiritual growth. So lets understand….how to make each day of Diwali a happy one !! On this day the Deities & Demons did ‘Samudra Manthan’(Churning of Sea) and out of that Lord Dhanvantri had appeared with a vase full of medicines to cure all diseases. So, on the day of Dhanteras ‘HE’ is worshipped for a healthy & disease free life. On this day, buying of silver vessel is considered to be auspicious. There is a story in ‘PadmaPurana’ related to this – Once the ‘Yamraja’ asked its messengers – “Do you ever feel pity or sorrow when you take life from the creatures on the earth (the mirtyuloka)” ? The messenger said –“ Yes Lord!” when somebody dies before time, we feel very sad and distressed. Once we had to take life of a prince on the very fourth day of his wedding. At that time, when we saw the outcry , sorrow , screaming & screech, we hated ourselves and felt very bad. 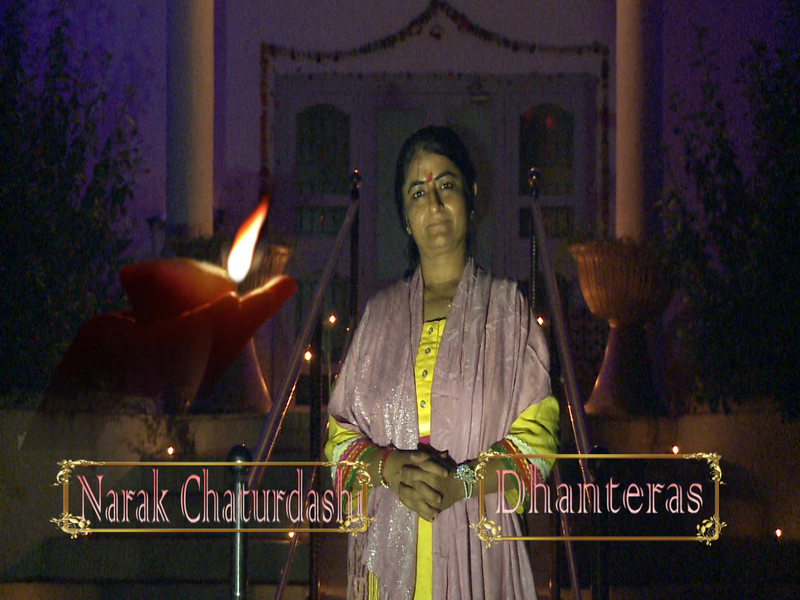 Yamraja on request said –“ Anybody who will offer diyas(lamps) on Dhanteras with this objective , will never die before time. Get up early in the morning , have bath and wear fresh clothes, worship Lord Dhanvantri and pray for a healthy life . If the picture of Lord Dhanvantri is not available, then you can worship the picture of Lord Vishnu, having soulful feelings for Lord Dhanvantri. Then give Salutation to Sun God , offer red flowers to HIM and pray for health. Mrutyunaa paash hasten kaalen bharyayaa seh! Tryodashyaam deepdaanat suryajah priyataamiti !! Om namah bhagyalakshami ch vidmahe! Ashta lakshami ch dhimahi, tanno lakshami prachodayaat !! One devotee to Sh. Sh. 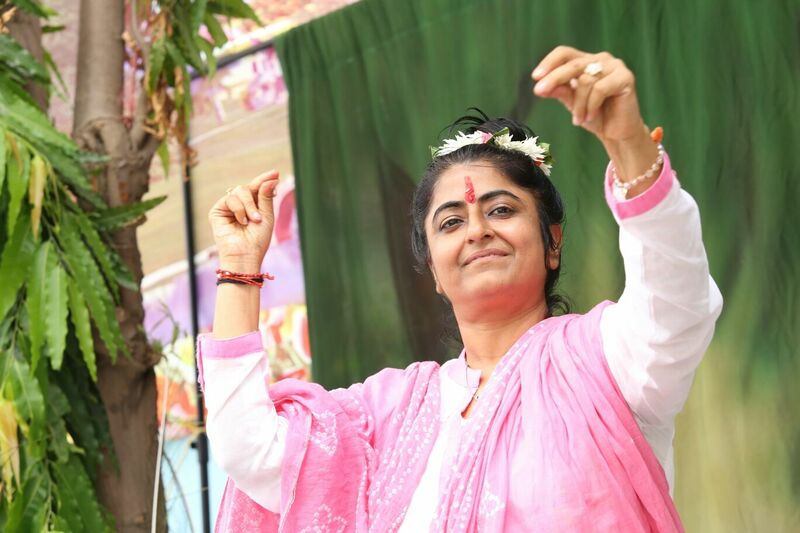 Bharti Shriji: Prabhuji! what is this? We request you to please explain it in detail. 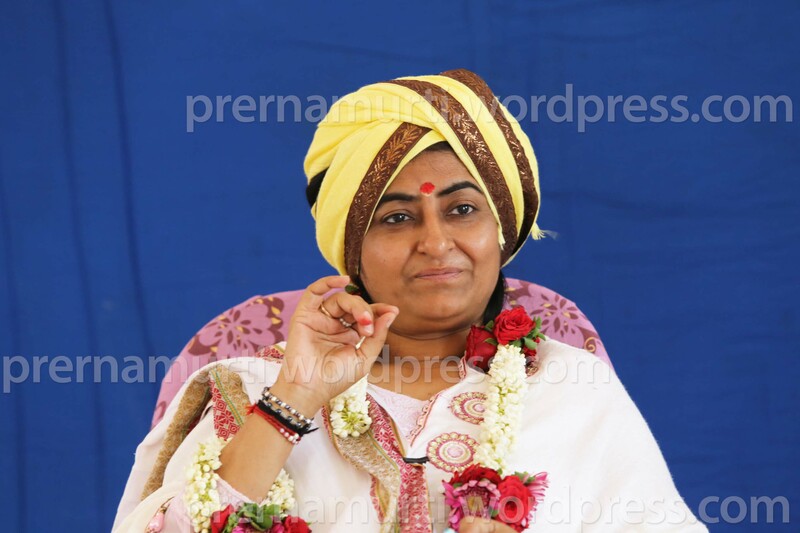 Sh.Sh.Bharti Shriji :This is the kingdom of king Muchukund.In the kingdom of king Muchukund, even animals and birds would not eat grass on ekadashi. The same is being proclaimed here. In that city, it was being proclaimed – Listen listen listen, today is Dashami. Listen listen listen, tomorrow is Ekadashi. Nobody shall have meals. Looking at this, Shobhan became speechless. Why is this happening? And what is this? He asked his wife, “Chandrabhaga, what is this”? In your father’s kingdom, why is it being proclaimed that today is Dashami and tomorrow is ekadashi! Then Muchukund’s daughter Chandrabhaga told her husband – “In my father’s kingdom, even animals and birds abstain from eating food and drinking water on the day of Ekadashi, then what to say about humans ….!! In my father’s kingdom, the entire population, right from children to the old people observe ekadashi fast. So,if you won’t observe ekadashi fast, then people will start taunting you. Shobhan says – Oh dear, you are right. Whatever you will say, I will do that only”. While narrating this incident to Yudhisthira, Lord Krishna says – Dear King, Shobhan observed the fast of Rama Ekadashi with full determination. He observed fast , but people who are not used to observe fast keep on thinking that – Today is my fast and I can’t tolerate the hunger…!! If you are determined, then you will notice, that, the day on which fast is being observed, you won’t feel hungry and the day on which you know that you can have your meals, you feel hungry every now and then. But Shobhan was fasting for the first time ever. That thought was lingering on in Shobhan’s mind that – Today I have observed fast, Today I have observed fast.He was dying of hunger. Next morning,by the time the sun was about to rise, he expired.King Muchukund carried out the funeral of his son- in- law.After that, Chandrabhaga started living with her father. Lord Krishna told Yudhisthira – Do you know what happened by observing fast of Rama ekadashi? For more click here to see video………. This is Kartika month(the eighth lunar month in Hindu Calendar).In this month, doing charity and holy deeds has a lot of significance. One should wake up early in the morning before sun rise. On Dwitiya, Saptami, Navami, Dashami, Thrayodashi and Amavasya(i.e 2,7,9,10,13,15th day) , use of amla(gooseberry) should be avoided ,whereas on the remaining days, one should take bath with the mixture of sesame seeds and gooseberry juice which prevents physical illness. By sitting & eating food under gooseberry tree, the diseases, caused by unwanted elements in food, are prevented during the year. In Kartika Month, there is a lot of significance of donating diyas(lamps). In this month, lighting a diya of ghee(clarified butter) or sesame oil during evening time, in front of Guru or Lord Vishnu improves one’s eyesight. One should offer Tulsi(basil) to Lord Vishnu or Shaligram( a most sacred stone used for worshipping) in Kartika month which blesses with luxuries & liberation and at the same time eliminates troubles/ illness. Minimum 108 Tulsi leaves should be offered. Black gram (urad dal), honey, sesame oil, milk of cow, goat, buffalo only should be consumed. Gooseberry leaves should not be plucked in Kartik month. That’s why one should try to eat food beneath gooseberry tree or else keep gooseberry fruits near oneself. In this period, the intake of pulses should be kept to minimum. mantra to recite for Yama-Tarpan (offerings to the God of Death) while facing south direction and donating diya with the intension of pleasing Yamaraja which prevents accidental deaths & what shall be done on Trayodashi, Chaturdashi, Diwali and New Year. ..today is ekadashi; japa,meditation, spiritual discourse on this day will benefit you infinitely.. Celebrate with joy, happiness& whole heartedly..
Man has made himself the slave of comforts , that’s why he is unhappy and disturbed. If somebody says good about him , he becomes happy; if some says ill of him, he becomes unhappy and hurt. Just like the switch of lights, which are on a board, if someone switches on, the light or fan starts and when switches off , light & fan stops; similarly, if you get happy or hurt by someone saying something, then it means that you have given the cord of your life in someone else’s hands. Make yourself so tough and determined , whether things happen according to your wishes or not, you have the feeling of thankfulness towards God. Always stay balanced in any situation, enjoy the feeling of being balanced or leveled in any circumstances. Keep the switch of your feelings in your hands; don’t become slave of circumstances.. Your heart is filled with the divine nectar of that Supreme Lord.. This moment of time is very pious, its beautiful..
when there is filled in heart devotion towards That Supreme Lord, when my dearest Lord conveys some message, He knocks the doors of the heart, that time is always beautiful…. There is no happiness lies in the worldly pleasures, which are momentary like the lightning in the sky.. This happiness is the outcome of the company of Saints, their spiritual discourses & getting One with the Self only.. This is the true happiness, which cannot be attained by through our roaming senses.. When our senses are in our control, only then we can feel this happiness..
O’Lord , You are so kind & compassionate, You don’t forget us in any circumstances, always reside in me, inspires me to do right things even my senses roam here & there..
YOU ARE MINE , I AM YOURS.. 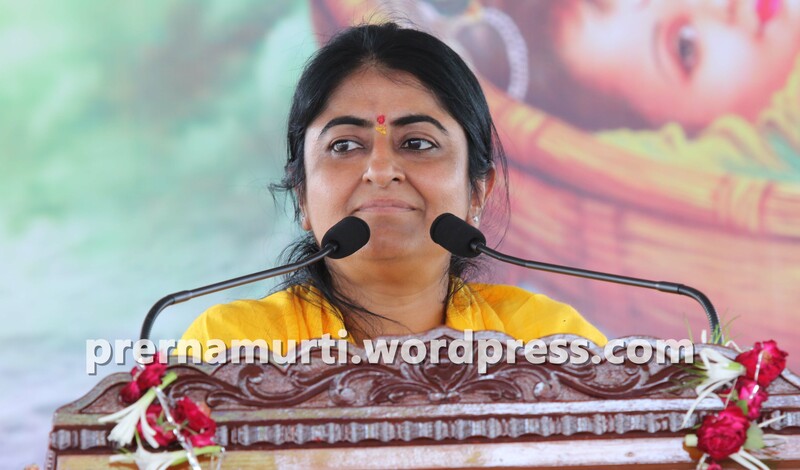 The above life inspiring words are the excrepts of spiritual discourses by PRERNAMURTI BHARTI SHRIJI, who is a renowed spiritual leader …an inspiration beyond imagination. 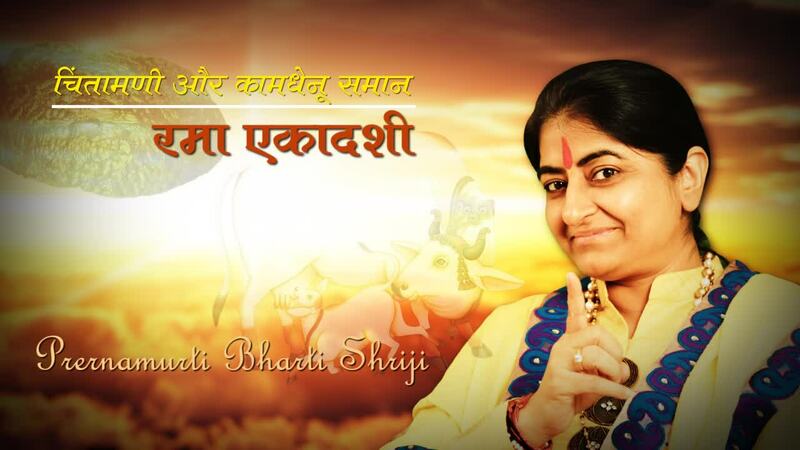 PRERNAMURTI BHARTI SHRIJI has undertaken and always strives best for betterment and upliftment of the mankind through various religious and social activities. Sharad Purnima( full moon day of Hindu Lunar month of Aswin (Sep-Oct), is also known as ‘Rasotsav’(day on which Lord Krishna showered nectar through His flute) because on the night of Sharad Purnima, Lord Krishna played flute and showered nectar through it. When He played flute, few Gopis who were milking cows ,immediately, when they heard the sound of flute, they ran away in the direction where flute was being played calling for ‘Krishna, Krishna, Krishna, Krishna…. leaving behind milking halfway. Some Gopis were igniting stove. They also ran away leaving behind the stove half ignited. Few of them were wearing cloths; they wore the bottom cloth at top and top cloth on the head and just ran away madly after Krishna. Few were combing their hair, they left the hair half braided and half open and went after Krishna. Few applied some kajal on eyes and some on cheeks and ran away. The One, who attracts and pulls towards Himself is named as Krishna. Those Gopis are our tendencies and attitude. The importance of Lord Krishna cannot be understood till this world is considered to be real. 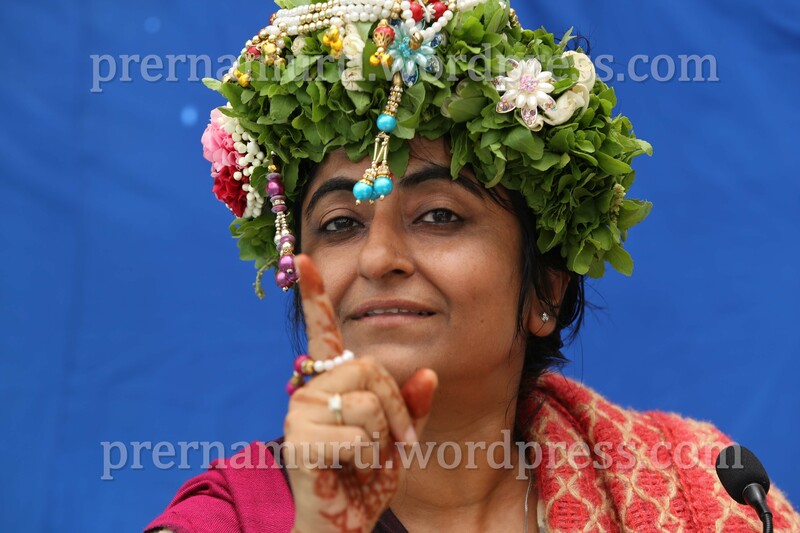 When the importance of Lord Krishna is understood and the devotion and love towards Krishna is attained, then these artificial things have no value-what makeup and what work…. 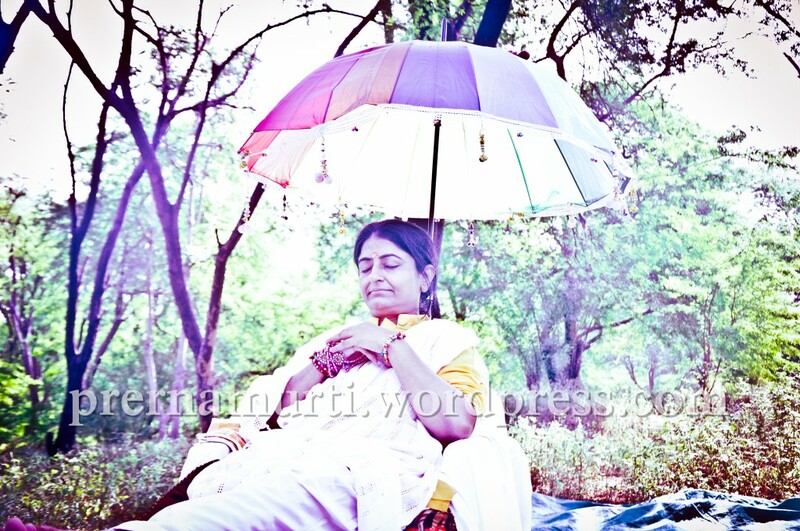 One leaves behind everything and starts doing bhakti(devotion) of that Lord…!! Gopis would go mad when they listen to the divinely melodious sound of Krishna’s flute. One of the Gopis was feeding milk to baby, she left the baby aside, crying and screaming and ran away going mad for Krishna. One was eating food; she left the food and went after Krishna. One applied eye liner some on eyes and some here & there and ran after Him. One left the hair half braided and went away. Playing flute is the invocation of Lord Krishna. When He plays flute, it means He is calling Gopis. It indicates that the devotees have to run. They leave aside all their work and run after Krishna. Similarly, in our hearts too, that Lord plays flute sometimes by giving sorrows, sometimes by giving happiness, sometimes through his existence, sometimes through experience, sometimes through His wisdom. His flute is being played, but you don’t listen to it. When you will hear it, then you also will leave behind all the work of this materialistic world and start meditating on that Supreme God alone…!! Sharad Purnima gives you the message, that, when you will consider all the materialistic work to be trivial and only Krishna as your main goal, then you also will become happy like Gopis. Baghel Khand, Bandhav Garh. There lived a King, called Veer Singh. The person who served Veer Singh, Shri Senji was a very kind man. He had family ties with the royal family. His ancestors were barbers who served the royal family’s ancestors. Shri Senji also served King Veer Singh. Senji’s routine consisted of regularly going to the King, trimming his beard, applying oil, cutting his hair, massaging it and giving him a bath. But Shri Senji had taken the shelter of God. He had taken the shelter of devotion to God. He had also taken the shelter of Saints. He loved doing their service. Some people say we believe in God but we don’t believe in any Gur(SpiritualMaster). But one who believes in God cannot survive without believing in Saints. One who cannot believe in Saints, what belief can he have in God!? Even the Supreme Lord Krishna says, “O’Udhav! Saints are the most dear to me! I always follow them, wherever They reside. Udhav!Saints are most dear to me!” God leaves His Godliness and massages THE Lotus Feet OF saints’ . Lord Krishna used to massage Sage Durvasa’s feet. God Himself had picked up plates in which Saints had eaten, after the Rajsuya Yajna . He Himself is God, yet he does not miss rendering service to saints. But those who out of false ego, think themselves to be the supereme and say that they do not believe in any Guru, they are the most foolish people on the earth. We don’t believe in any Guru. We don’t believe in saints. We believe only in God. We believe only in Baanke Bihari (a name of Lord Krishna). So, brother, you believe in Baanke Bihari. Do you believe in Baanke Bihari for Baanke Bihari’s sake or to have faith in Him? Do you believe only in His form and if you believe in His principles, then you will not be able to survive without surrendering to Saints. Because, where God surrenders, what value does your surrender carry? Lord Krishna and Rukmini(His wife) pulled Sage Durvasa’s chariot. Durvasa was alert, if there is any sign of grudge on Rukmini’s face. Now there is no sign of grudge on either Lord Krishna’s countenance or on Rukmini’s. So the sage says, “Krishna! Doesn’t it occur to you as to how tender Rukmini can pull a chariot?” Lord Krishna replied, “O’ revered Sage! This is our good fortune that we have got such an opportunity to serve supremely generous saints like you. I am fortunate. From that itself Lord Krishna got a boon.“ So Durvasa offered kheer to God in the form of an offering which had been given by Saints. What importance is attributed to Saints! Ordinary people cannot understand this. Shri Sen was a server of Saints. He liked serving them. One day, it so happened that Shri Sen had set out from his house. Then a gathering of Saints passed by chanting, “Hare Rama, Hare Rama..”There is sweetness in God’s name. If I say “Jaggery, jaggery..” then no sweetness is felt in one’s mouth. If I say “chilli…” then no hot sensation is felt in the mouth. If I say “sugar…” then no sweetness is felt in the mouth. But if I say “Rama…” then sweetness is felt in the mouth. You will have to believe this. The heart becomes sweet. This you will have to believe. If you chant God’s name properly even once, the heart becomes sweet and is filled with the nectar of life. Now Shri Sen while singing kirtan(devotional song) got entranced and started dancing. Emotions sprung up and his heart was filled with devotion. He forgot that the King had told him to come daily and complete his work of a barber. It was work entrusted to him for a long time. He forgot. He started surrendering himself at the divine feet of Saints. He asked the Saints to come to visit his house. They refused initially, but he insisted and said ‘how can you leave this village without visiting my house’? So they agreed. One who takes the shelter of God remains worriless and fearless. They remain in a mirthful state. When a devotee becomes worriless and takes the shelter of God, then He too fills your empty place. But if you have more faith in worldly shelter than in God, you are no where. God is supremely dear and compassionate.